Believers, if you have been with us daily in this devotional you should be seeing what this verse is saying—that we believers have been given all things that pertain to life and godliness. We just need to know that and walk in it daily. 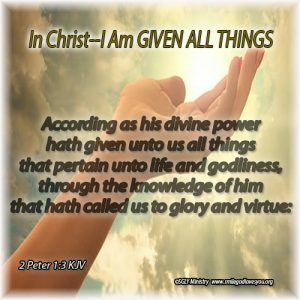 The New Living Translation of this verse says it this way: By his divine power, God has given us everything we need for living a godly life. We have received all of this by coming to know him, the one who called us to himself by means of his marvelous glory and excellence. In this 2 Peter 1st Chapter, verses 4-9, Peter goes on to list all of the things we have been given: exceedingly great and precious promises, ability to share in the divine nature, ability to escape the world’s lustful corruption, diligence, faith, virtue, knowledge, self-control, perseverance, godliness, brotherly kindness, and love. It is amazing! In Christ we are a people most blessed! Let’s believe it and walk in it daily!